Storm's Arashi Rattlin' Wake Crank runs just under the surface with a hard rolling action and a pronounced tail kick creating a large wake that draws attention. Fish it slow or fast, this Arashi keeps waking and running true at any speed. 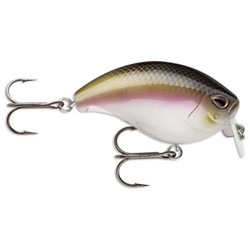 This crankbait features a single ball rattle system which creates a knocking cadence and low frequency pitch that fish can perceive at greater distances and track to the source. The Wake Crank has rotated hook hangers which nests the hooks close to the body for improved action, preventing hang-ups and allowing larger hooks. The self-tuning line tie is a free-moving design that keeps the lure tracking true, ensuring non-stop fishing action. Specifications include: 2-3/8" body length, 9/16oz in weight, and #3 & #4 treble hooks.